In 2009, Anorthosis Famagusta made the group stages of the Champions League. At the time it was the greatest achievement in Cypriot football. Another Cypriot club, Apoel Nicosia, has gone even further, making it through the group stages then on to beat French team Olympique Lyonnais for the right to face Real Madrid in the quarter finals. Australia also has a football connection with Cyprus. Former Socceroo great Paul Okon spent the latter stages of his career at Apoel and recently young Aussie Costa Andricopoulos, a former Apoel player, is currently playing with Anorthosis Famagusta. I spent some time with Costa to find out about football and life in Cyprus. The first question I asked was how he got started in football. “Growing up, I was always in the backyard and at the park kicking a football around with my dad, who also played in the NSL in the 1980s, I started playing local park football at the age of seven for Kingsgrove All Stars. I asked Andricopoulos about the Paul Okon connection and about the legacy he left in Cyprus. I contacted Paul Okon and asked him what it was like playing in Cyprus: “Cyprus was a very different experience, but one I’m grateful to have had. Apoel is a big club with great supporters”. With limited opportunities in the A-League, Andricopoulos thought a move overseas was the way forward for him. “I have not been approached by any A-League clubs as yet, I have been to a few sessions over the last few years with a few clubs like Sydney FC for two months and the Newcastle Jets when I was 17. As is the case with many Aussies abroad, it wasn’t smooth sailing at the beginning with loan moves and relegation. 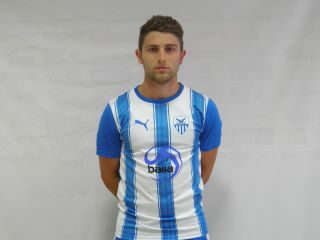 When Andricopoulos first moved to Cyprus he signed for Apoel FC reserves (1st division) then towards the end of that first season he got loaned out to their feeder team, Ethnikos Latsion FC for two months. Then when the season finished with Ethnikos he went for a three week trial at Doxa Katokopias. That deal didn’t eventuate, with the manager who took him on trial being let go when the club were relegated to the 2nd division. Luckily Costa got a call from the coach at Anorthosis asking if he wanted to sign. Now settled, Costa got to play some first team football and he also got a taste of European football. His European experience included playing friendly matches against Lokomotive Moscow and getting an assist, Dynamo Kiev, FC Tuggen (Switzerland) and FC Luch Energia Vladivostok (Russia). “I would love to play in the A-League someday, but for now I have to keep focused and keep working and progressing here in Europe.